Today I'm continuing my series using our Limited Edition products which will only be available for another week - 30th November is absolutely the last day you'll have to get your hands on these. For today's project I am returning to the Snowfall Thinlits dies. This is a very simple little card. I began with a Whisper White card blank and then added a panel of Pool Party cardstock. The banner background panel is made with a paper from the 6" x 6" Designer Series Paper stack in Subtles. 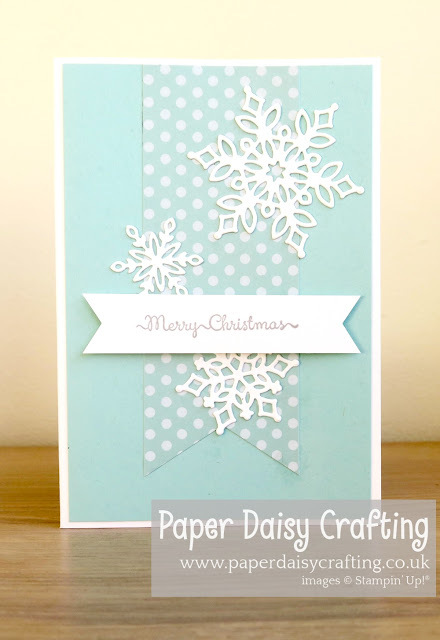 I then die cut the three snowflakes in White White and added the sentiment banner using the "Merry Christmas" from Hung With Care set. I really hope you've been enjoying these projects using the limited edition Snowflake Showcase products. I've really loved using them. Tomorrow I'll be back with another video tutorial showing you how to make some gorgeous Christmas table favours - don't miss it (subscribe on the right if you haven't already done so! ).